Credit: Schomburg Center for Research in Black Culture, New York Public Library Digital Collections. Hillary Clinton got her knuckles rapped for her recent old-school, pre-Civil Rights Movement interpretation of Reconstruction in which a vindictive North shared blame with the defeated white South for what went wrong during the tumultuous period that followed the Civil War. If a presidential candidate can't get it right, what about the rest of America? There's a generation's worth of new thinking about Reconstruction, especially what it meant for America's 4 million former slaves and how they were given equal rights and then had them snatched away. It's summed up with crisp authority in this article by Eric Foner, the Columbia University historian who earlier wrote the best-selling "Reconstruction: America's Unfinished Revolution, 1863-1877." But despite all the scholarly work by Foner and other recent and contemporary historians discrediting their old-school predecessors, Reconstruction continues to occupy an uneasy place in American memory. The National Park Service, the keeper of the nation's history flame, wants to change that. Last year, Director Jonathan B. Jarvis announced a "National Historic Landmark Theme Study on the U.S. Reconstruction Era" because the period was so "often ignored or misunderstood." not least by the NPS. How about "almost always ignored"? Charleston, for example, promotes its "living history." But none of its official carriage tours go by, or even mention, the site right in the middle of the Historic District where one of the most significant events of Reconstruction anywhere took place -- the auspicious state constitutional convention of 1868. Today all that's left is a courtyard that's part of the federal complex of buildings in the J. Waties Waring Judicial Center. But in 1868, the courtyard led to the grand, Corinthian-pillared Charleston Club House, where the convention was held. The Club House was reduced to a battered shell in the earthquake of 1886 and had to be demolished. The location of the now-gone Charleston Club House, at 71 Meeting St., where the constitutional convention of 1868 was held from Jan. 14 to March 17. 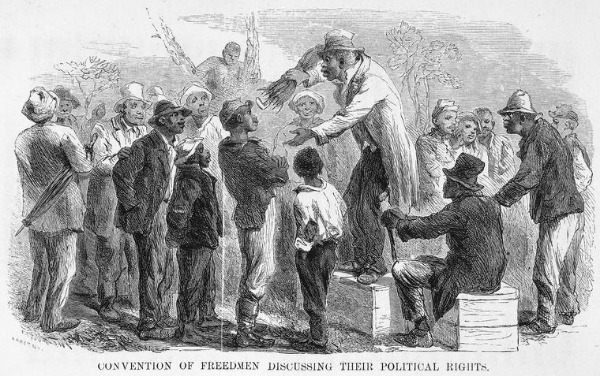 The convention's white and black delegates, which included former slaveholding planters and also freed slaves, drew up a constitution that not only granted suffrage to black males -- the condition imposed by the Republican-controlled U.S. Congress before rebellious Southern states could re-enter the Union -- but also did so without any conditions, such as property ownership or literacy. Not even the constitutions of some Northern states included such sweeping voting rights. The convention also approved creation of a non-segregated statewide public school system, eliminated property ownership as a condition for voting power and granted legal rights to women. William J. Whipper, a black delegate who had been a strong supporter of relief for financially threatened planters, said in floor debate: "It is our duty, our privilege, to relieve them." His position prevailed in a showdown vote. Race hovered over all 53 days of the proceedings, but at decisive moments, the delegates didn't act as white and black blocs. Black delegate William J. Whipper, who had been an antebellum abolitionist lawyer in Pennsylvania, served in a black Union regiment in the war and would become one of the most influential members of the South Carolina legislature under the new constitution, said during debate on whether white planters should get financial relief: "...our sole object should be to pass laws that will benefit the whole people of South Carolina. And if we see any class of people suffering here, it is our duty, our privilege, to relieve them." Whipper's argument helped to muster 16 votes from the black convention majority in favor of financial relief for the planters, and the measure was approved, 57 to 52. Albert G. Mackey, who, as President of the convention, helped to defuse heated confrontations during debates and keep business moving along toward a successful adjournment on March 14, 1868. There were moments during convention debates when heated disputes -- some of them racially based -- threatened to tear the assembly apart. But the convention president, the white Charleston physician Albert G. Mackey, masterfully kept the proceedings going, even if he sometimes had to admonish a fitful delegate to take his leave. The city, through its cultural and educational institutions, business associations and rights advocacy groups, as well as City Hall, can make up for this massive snub of history by mounting a 150th anniversary of the convention in January-March of 2018. The first thing the city should do is ask the National Park Service to identify the former 71 Meeting St. as an official Reconstruction national site. The Club House where the convention was held is gone, but there's room in the courtyard for a marker. Perhaps space could be found in the adjacent J. Waties Waring Judicial Center for an exhibition where at least a part of the assembly hall could be recreated, so visitors could get a feel for what happened 150 years ago. Personal video displays could show an annotated transcript of the proceedings. A week-long series of forums, speeches and other events during the anniversary celebration would help audiences gain a fuller understanding of Reconstruction than perhaps Hillary Clinton was able to get at her public schools in the Chicago suburb of Park Ridge or at Wellesley College. The electric moments of debate on crucial issues could be captured in sketches prepared by local acting groups speaking in the delegates' language, which, on occasion, reached Ciceronian levels of eloquence. The community has the resources to mount a sesquicentennial celebration that would, after long last, do justice to the constitutional convention of 1868. The occasion would not only bring to life an important but ignored chapter of Charleston's history and heritage, but also help inspire all America to have a more confident understanding of Reconstruction and its "unfinished revolution." National Park Service education specialist Michael Allen and Ciera Gordan, a NPS intern and graduate student in history at College of Charleston, will provide an update on the agency's "Reconstructing the Reconstruction Era" project at a brown-bag lunch at the Avery Center on Wednesday, April. 20, from 12 noon to 1:15 p.m.
Allen and Gordan will review the Park Service's "Reconstruction Era Theme Study," which, when completed later this year, will be the basis for establishing a series of historic sites commemorating major events during Reconstruction in South Carolina and other Southeastern states. Allen is coordinator of the project and Gordan has been involved as well. For more information, contact Mary Battle, Public Historian at the Avery Center, at battlemp@cofc.edu. and (843) 953-7609. The Avery Center is at 125 Bull St. on the College of Charleston campus.